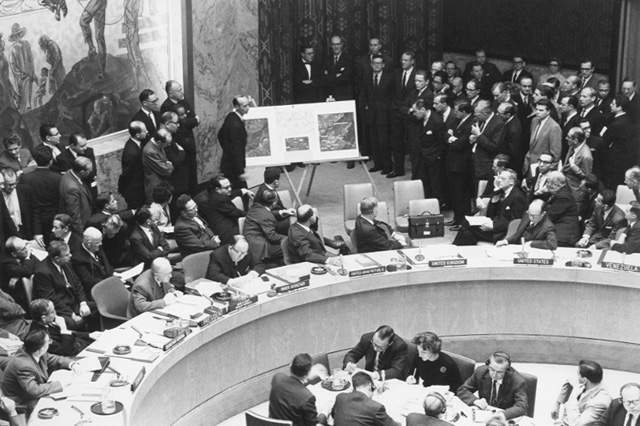 Swords Into Plowshares: "Until Hell Freezes Over"
On this date in 1962, Adlai Stevenson, the U.S. ambassador to the United Nations, uttered what may well be the most memorable line ever used in a Security Council debate. 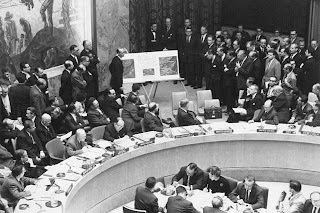 Before presenting the Security Council with photographic evidence of the Soviet missile buildup in Cuba, Stevenson asked, "Do you, Ambassador Zorin, deny that the U.S.S.R. has placed and is placing medium- and intermediate-range missiles and sites in Cuba? Yes or no—don’t wait for the translation—yes or no?" Stevenson (standing next to the easel in the photo below) proceeded to display evidence from American U-2 flights over Cuba of Soviet missile sites.